Really cute! Love that DP and those metal embellies are fabulous! Sweet image and how perfect to place these metal embellies as the sketch star element! 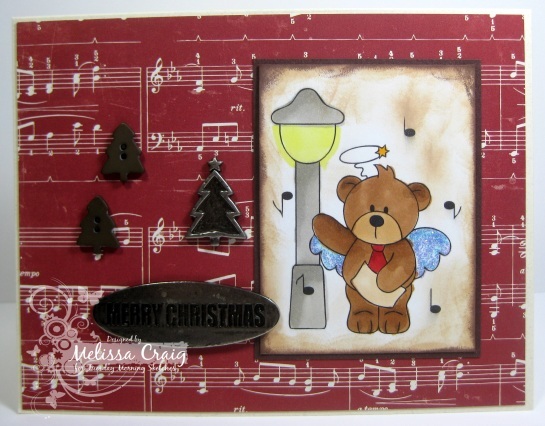 So cute Melissa, love the paper, image and metal embellies. Those embellishments worked so well with this sketch. What a lovely musical card. That caroling bear is adorable and beautifully colored. Love the embellishments. So totally cute!! Love the antique-ing you did on the background of the image. Great coloring lady. Very well done. So very cute Melissa! Love the music note paper. So pretty!